Head gaskets are designed for specific operating environments, with higher combustion pressures dictating the use of higher-strength construction. 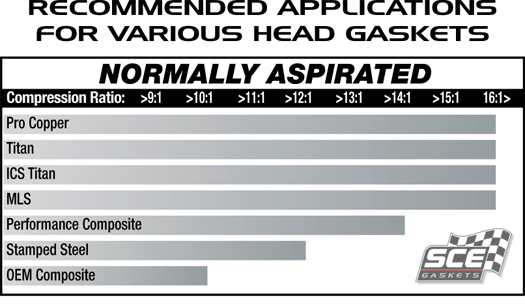 We have compiled a series of charts that show the baseline limitations for each type of gasket in normally aspirated, supercharged and nitrous oxide-boosted engines. These are only guidelines, as actual engine combinations (camshaft specs, type of fuel used, etc.) 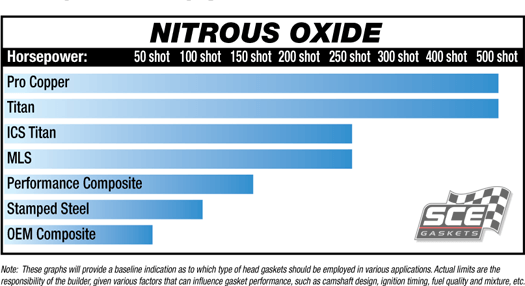 can have an impact on ultimate combustion pressures. Click here to download a PDF of all three charts below.